ABA, Discrete Trial Teaching, Verbal Behavior Analysis, Natural Environment Teaching, and Incidental Teaching Programs share one necessary common feature: Data collection and analysis! The process of translating collected data to interpretable, organized, meaningful visual displays can be a daunting, time consuming task for behavior analysts, parents, and teachers. 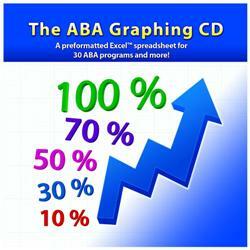 The ABA Graphing CD will help you save time while making professional behavioral graphs. It contains a preformatted Excel™ spreadsheet for 30 ABA programs; a step-by-step guide describing and showing screen shots; a daily Data Sheet; Monthly Data Sheet; and ASAP™ Preference Assessment Form. The preformatted spreadsheet allows you to enter data for up to 30 different ABA programs. Entered data automatically updates an individualized graph for that program and instantly produces high quality behavioral graphs. Each program is preformatted for three different steps. The CD is compatible with both Windows and Macintosh operating systems. This week only, save 15% on the ABA Graphing CD by entering the Promo Code BLOGABAG at checkout. *Offer expires on March 6, 2012 at 11:59 pm EST. Not compatible with any other offer. Be sure there are no spaces after the Promo Code when you enter it at checkout. Written by: Different Roads to Learning on February 28, 2012.on February 22, 2012. This entry was posted in ABA, autistic spectrum disorder, Difflearn Promo Code, Pick of the Week, Sale, Technology and tagged ABA, ABA Graphing, Applied Behavior Analysis, autism, autism education, autistic spectrum disorder, Data Collection, Resources, teaching tools by Different Roads to Learning. Bookmark the permalink.